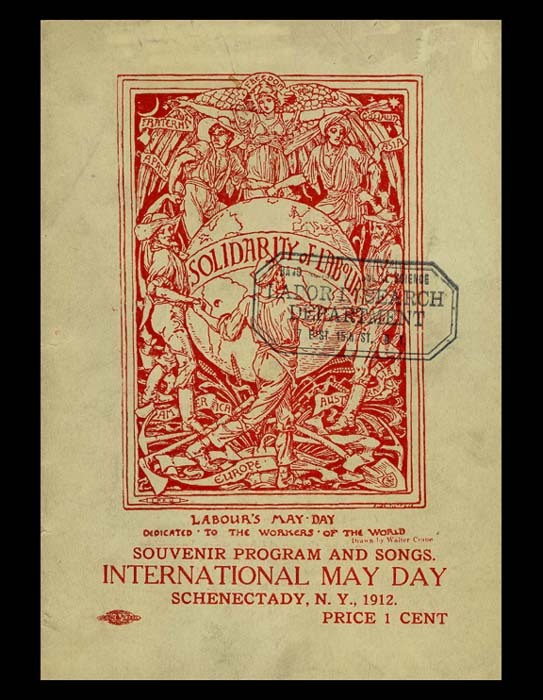 "Solidarity of Labour" beribbons the globe on the cover of this souvenir program from the May Day celebration in Schenectady, New York in 1912. The Walter Crane drawing features people joining together from Asia, Australia, America, Africa, and all around the world, amid primarily agricultural tools of their work. The program notes inside credit the AFL convention of 1888 with the "idea of celebrating the awakening of the working class consciousness of its true position in organized society on May Day." See other May Day photos from the 1930s here. Photographs by John Albok, a Hungarian photographer who documented the street scenes of New York during the Great Depression.